Every summer in Southern Germany, Austria and Switzerland, tons of brown trout perish. An interdisciplinary team from the Technical University of Munich (TUM) has now discovered the culprit of the mysterious dying afflicting brown trout. It is triggered by a previously unknown virus. The setting is always in the same river sections. And the victims are always brown trout. Within a matter of days, their skin turns dark and the animals perish. Researchers and authorities have been hunting down the cause of this mysterious mass mortality for decades – unsuccessfully, until now. Using cutting-edge analysis methods, Prof. Ralph Kühn and a research team from the Technical University of Munich have now identified the pathogen that triggers the proliferative darkening syndrome (PDS) in brown trout. "The biggest challenge was identifying a pathogen nobody knew. At the outset, it was not even clear whether it was a bacterium, a virus, a parasite or an environmental toxin," recalls the biologist. Ten years of scientific detective work followed. The researchers set up two experimental stations at the Iller river – one in the headwaters, near Obersdorf, where the fish disease had never been observed; a second one in the lower course near Kempten, where brown trout die every summer. At both stations, the researchers set up aquariums fed with river water. From May to September they observed the fish in the aquariums and took tissue samples that were frozen and sent to the TUM laboratory for analysis. The observations indicated that PDS advances in three phases. Initially, the fish look healthy. Then changes in internal organs such as the liver and kidneys appear. In the third phase, the brown trout skin turns dark and the animals die shortly thereafter. "The progression of the disease quickly led us to suspect that PDS was a viral disease,” says Kühn. To detect the virus in the samples, the researchers deployed a set of modern molecular genetic procedures, known as next generation technology. Genomes can be analyzed rigorously using these procedures. First, the progression of the disease in the fish was characterized at the gene response level. Subsequently, the researchers looked at animals with a similar immune response to determine the nucleotide sequence of all inherited genetic material – of the fish and its possible pathogens. The researchers deployed computer programs to pinpoint the pathogenic virus in this mountain of genetic data. Using deep bioinformatic processing, they successfully identified parts of the pathogen’s genetic profile and compared them to the profiles of known viruses. Extended, virus-specific sequencing led to the determination of the viral genome. 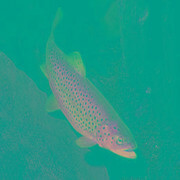 The result: The culprit behind the demise of the brown trout is a piscine reovirus. It is related to the virus that infects salmon in the North Atlantic and the Pacific, where it causes significant economic damage. In the next step, the researchers hope to grow the virus in the laboratory and investigate why it only occurs in certain sections of the Alpine rivers and to what extent global fish trade facilitates its spread. The project of the TUM consortium Brown Trout Dying (Department of Zoology, Department of Aquatic Systems Biology, Department of Animal Physiology & Immunology) was funded by the Bavarian State Office for the Environment and the Bavarian State Ministry of Food, Agriculture and Forestry. Another co-operation partner was the Advisory Service for Fishery Lower Bavaria in Landshut (Bavaria).